A sad and reluctant sale due to a change in family circumstances. I have been rebuilding this boat over the last year to an exceptionally high standard as it was my intention to keep it long term. 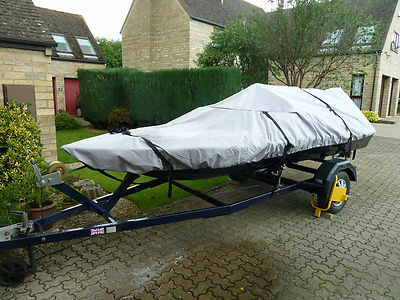 Having only just completed it (there are a few minor things left to do, but these should be finished before the end of the auction) and excited about putting it in the water for the first time, I am now forced to sell the boat before I even get to try it!!! General detailsThis is Picton speed boat of approximately 18 feet in length overall and is yet to see any water. It comes complete with a beautiful galvanized trailer that has been resprayed to match the hull and a variety of accessories.I also have a folder full of receipts and an invoices. HullThe hull has just been professionally sprayed blue to the undersides, white to the topsides with metallic silver finishing. It was sprayed with an etch primer to ensure a good solid key to the base, high build primer for an ultra smooth high gloss finish followed by the base colour and lacquer coats. I replaced all the drain bungs with quality new at the same time. It does look truly stunning especially with the chromed cleats reflecting the blue and sparkling in the sun, however I did manage to damage a very small area of the paint work when we moved it off the old original trailer onto the nice new one, so it requires a minor bit of touching up. InteriorThe original carpets were removed along with all the old trim. It now has a brand new fitted lining/carpet in blue to match the hull and seats, plus all the trim has been replaced in grey and finished off with white piping around the edges. The 5 seats are also brand new and still have the plastic covers on from the manufacturers. Both front seats are on runners so it is easy getting in and out. The steering wheel and cables are all brand new and greased up so they will last for years to come. It has a new ignition switch and new 12v accessories socket to charge up your mobile or MP3. The centre consul houses a CD/FM/AM/MP3 radio which has four brand new speakers, two in the front and two for the rear. Finally it has a brand new fire extinguisher mounted to the right of the captain’s seat. EngineThe engine is a 75hp Mercury outboard with hydraulic tilt and lift. Last week the engine had a new impeller fitted, gearbox oil replaced and the engine checked over. I have also replaced the fuel tank with a brand new one which is considerably bigger at 30ltrs than the original. It also includes a brand new fuel line and primer bulb. The battery is less than a month old and is a high capacity marine type the size of a whale.It has quick release cables so you can easily disconnect it when not in use or storage. But it also has a brand new solar powered trickle charger to maintain the battery and extend its life. I am currently checking the hydraulic pump for the tilt and lift rams. This should be finished before the end of the auction however if there is a delay it is a simple small job of attaching the pipes. TrailerThe trailer is beautiful. It is galvanized but resprayed in the same paint to match the blue hull. It is braked, has brand new mudguards, brand new mudguard brackets with rubber matting to the top so they can be used as a step to get in and out of the boat easily. Brand new reflectors all round. Brand new rollers, brand new V snubber block and a brand new heavy duty winch. The tyres are like new and comes complete with two more as spares. In fact one of the tyres I took the manufacturers label off the tread so it has never been on the road. It also comes with a brand new Trailer Board still in its manufactures plastic wrapper. Just add your number plate and you are ready to go. As you can see from the pictures it also has a wheel clamp which I bought just before Xmas,. Having spent so much time and effort in getting this boat to this high standard I didn’t want to have it stolen. It will also be included in the sale. AccessoriesThe boat comes with a high quality and very expensive waterproof cover as seen in the images. The material is designed to keep out the rain but still be able to breathe and is UV proofed.I have two brand new ropes as warps in blue to match the hull. They both have loops spliced in one end and have whipped ends to the tails so they can quickly be dropped over the cleats. I also have a number of other ropes, ratchet straps, brand new spare rollers for the trailer, spare carpet and upholstery material plus various other bits and pieces which I will include in the sale. Location/ViewingThe boat is at my home in the Cirencester. If you would like to view before bidding then you would be most welcome and I will even provide a cup of tea and a biscuit. Cirencester is in the middle of the M5, M4 and M40 motorways so easy to get to. It’s just an hour away from Birmingham, London or Southampton and 45 minutes from Oxford, Bristol or Reading. Hopefully I have listed everything but if you have any queries then simply call me, Simon, at the office on 01285 644091. Happy bidding! AddendumI noticed this morning that I did not have an pictures of the whole boat so I took another this evening immediately before it rained, but I only managed one before I got drenched!. If anyone would like extra pictures I will be happy to take some more and email them to you.